Are you interested in applying to University of Houston Law Center (UHLC)? We welcome and encourage you to visit. Throughout the year we have a number of ways and times that you can visit. During your visit you will have the opportunity to learn more about the law school, the faculty, classes, students, organizations as well as take a tour of the facility. During your visit, you will not have the opportunity to have an interview or a meeting with a member of the Admissions Committee. The UHLC does not offer interviews or evaluative meetings with members of the Admissions Committee nor are we able to accommodate requests for individual tours. Please review the types of visits and click on the link to select the date and time of the visit that best meets your needs. Law school tours are offered in conjunction with a classroom visit, Open House or Information Session. Tours are not offered as a standalone activity. During these sessions, prospective students will receive a general overview of the admissions process and the UH Law Center J.D. program. Tours of the Law Center will be available either immediately before or after the session depending on the session you selected to attend. (Approximately 90 minutes). 6-13-19 5:30 p.m. – 7:00 p.m.
7-12-19 2:00 p.m. – 3:30 p.m.
4-22-19 12:00 p.m. – 1:30 p.m.
5-21-19 12:00 p.m. – 1:30 p.m.
6-19-19 12:00 p.m. – 1:30 p.m.
Once you register, you will receive a confirmation of your registration along with a link for the Online Information Session 24 hours prior to the session. Have you ever wonder what it is like to attend a first year law class? To see brief descriptions of the first-year courses taken by all 1Ls, please click here. The Office of Admissions is happy to arrange a visit to a first year law school class and a tour during the Fall and Spring semesters. Class visits and tours are by appointment only. Tours will only occur before or after the class and are not offered as a standalone activity. When making your selection, please note whether there is a tour AND if the tour is scheduled before or after class. All class visits must be scheduled at least 48 hours in advance of the class you would like to attend. Class visits and tours may be requested by completing the below form. To schedule a class visit and tour, click here. During this session, prospective transfer students will receive a general overview of the transfer admissions process, information about the JD/LLM Dual Degree, Financial Aid, Career Development, Student Services, and more. Tours of the Law Center will be available at the end of the Transfer Student Day Program. To register, please click on the date and time below. Friday 06/07/19 12:00 p.m. – 3:30 p.m. 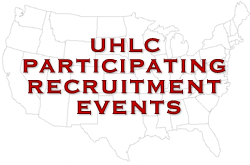 The University of Houston Law Center participates in Law School Forums, graduate & professional school fairs, and other events throughout Texas and around the country. We encourage you to visit us at an event in a city near you. Schedule. The University of Houston Law Center does not offer interviews or evaluative meetings with members of the Admissions Committee/Staff. In order to get your questions answered, please review the admissions process information, the Frequently Asked Questions and or plan to Visit the Law Center. Please complete the online form to request an appointment. If you have applied to the JD program and were not offered admission, you may schedule a time to discuss your application via telephone with a member of the admissions staff before applying in a subsequent year. Telephonic Re-applicant counseling is only offered one time per applicant from August 19th – August 30th and is intended to assist applicants in strengthening their future application should they chose to reapply. It is not an interview nor an opportunity to have your application reviewed or reconsidered for the current year. Application files are archived for one year. If you schedule a time to discuss your application via telephone within the year that your file is archived, we will review your previous application file with you in an effort to help you to identify strengths and weaknesses in your application, and explain the application review process. While you are on campus, you may also want to visit the University Lofts. The University Lofts are on-campus housing for our law students, conveniently located directly across the Law Center's parking lot. Please visit http://www.uh.edu/housing/housing-options/university-lofts%20/ for more information. For internet mapping, the best address to enter is 4604 Calhoun Road, Houston TX 77204. The Law Center is in the far northeast corner of the main campus, where Calhoun Road "dead ends" one block north of the intersection of Calhoun Rd and University Drive, just southwest of the intersection of Elgin and Spur 5. Click here for an interactive campus map to help you locate the Bates Law Building, the Law Library, Parking Lot 19B, the East garage, or the Visitor's parking garage. Meters – Lot 19B. Visitors may park at the meters located in the Law Center's parking lot (locate Lot 19B, here) with a valid receipt of purchase displayed on the dashboard of the vehicle. In addition, there are several metered parking spaces (2 hours maximum) located on the south side of Lot 19B, close to the Calhoun Lofts. Parking Garages. Visitor parking is also available in the Welcome Center parking garage located on University Drive and Calhoun Road, and at the East garage on Calhoun north of University. Locate these garages here. Both are a short walk from the Law Center. UH Parking & Transportation. For more information, please visit the main campus Parking & Transportation site.